Two high school students and sons of Overseas Filipino Workers (OFW) from the province of Zamboanga Sibugay made it to the National Search for the Outstanding Sons and Daughters of OFW Student Achievers, held March 2, 2015 at the National Commission for Culture and Arts (NCAA) Auditorium, Intramuros, Manila. 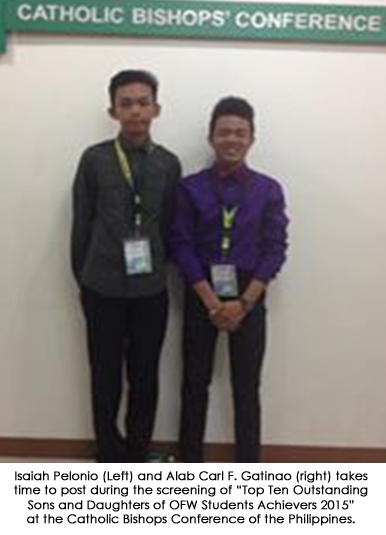 16-year old Alab Carl F. Gatinao, a graduating high school student of Zamboanga Sibugay National High School, placed 6th among the winners nationwide. Gatinao, who is the son of Imelda F. Gatinao, who is working as Welfare Officer in Beirut, Lebanon, was challenged to face the trials in life. He spent much of his time with friends, drinking and smoking. He even reached a point of not attending his classes for a month. However, with the help of his parents and teachers who encouraged him to focus more on his studies as he was a consistent honor student, he realized his mistakes and made a successful recovery which led him to become an outstanding student achiever. "I can't believe I won, but it was a challenge to me. As what Dr. Jose Rizal said, which I firmly believe, that the youth is the hope of our nation, so I am trying my best to become a good role model not only to the youth, but to the society, as well." Gatinao said. 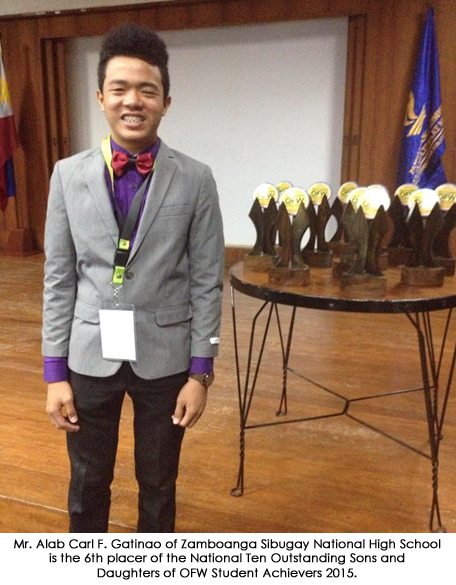 On the other hand, Isaiah A. Pelonia is a graduating student of Marian College of Ipil, Zamboanga Sibugay. He was also awarded as one of the Top Ten Student Achievers. Pelonia's mother is working as a baby sitter in the United Arab Emirates (UAE) while his father is unemployed. As the eldest in the family, he was inspired to do more of what is expected from him to be able to succeed and be of help to his family. Among the forty qualified students from different cities and municipalities nationwide, two were from Region 9, who were chosen to be included in the top 10. "I was impressed with the performances of these students who brought honor and glory to their respective schools and to the DOLE- OWWA Region 9 as a whole", Overseas Workers Welfare Administration-IX Regional Director Hassan Gabra T. Jumdain said during a courtesy visit with their parents held at OWWA-IX office, Zamboanga City. Jumdain further encouraged the winners to serve as a model and value the sacrifice of their parents who are working in other countries. The winners received Plaque of Excellence, medallions, and scholarship grants, which were presented by the Episcopal for the Pastoral Care of Migrants and Itinerant People (EPCMIP) Chairman, Most Rev. Ruperto Santos. The event marked the "7th Gawad Anak OFW", which was sponsored by the Catholic Bishops Conference of the Philippines (CBCP) in coordination with the EPCMIP.